Is there an easy way in Graphene to add a bit of SEO keyphrase text to the top of the Posts page, so it displays when visitors go to this page with 5 posts/articles’ excerpts? I’ve got another theme on one of our sites which has this capability, which is why I thought I could do it. I tried just typing some text but it doesn’t display; only the post excerpts do. Sorry but I’d really appreciate any assistance with this. Help, folks! With 30-something new posts typed in the 29 hours AFTER I posted mine â€” & every one of them having suitable helpful solutions to them, but not mine â€” which was fast disappearing to the bottom of the second page â€” I thought it would get lost, like some other posts I’ve noticed didn’t get replied to. Bearing that in mind, what would you do in this instance, John? And yes, I really respect the fact that people volunteer their time & expertise here to help. BTW, thanks… but that thread sounds like how to disassemble & fine-tune a turbocharger on my Mazda. Oh, well, sorry to trouble you. I guess I didn’t really need a solution on this one. No “free (and GPL)” theme can give easier solution than action hook widget for your requirements. Without the action hooks, you might need to hack the theme core or write a custom function with all contents in it, and hook it into a pluggable area. Graphene theme makes this process a lot easier. Finally, using the feature is left to you. Thanks, Prasanna, if action hooks ARE the easy solution, then can you type in the actual steps to use them in my situation, please? While taking into account my code-shy level of Graphene usage? If you are still confused after reading those posts, I don’t mind writing another tutorial for your particular case. Okay, Prasanna, many thanks for those, especially Syahir’s original. Great to finally read up on the power of action hooks after noticing them when I’ve been in & out of a couple of our Graphene-themed sites of late. Thing is: I’ve now had quite a go clicking action hooks on & off (mostly on the “loop…” links), & applying a Text Widget with some text to each newly activated Graphene action hook widget, then checking in the browser to see where & what the result is. But I haven’t determined which one will place the text on my WP-set Posts Page â€” as per my original posted request. If I PM you a temp Admin to the site in question, can you check to tell me which action hook I need to access? 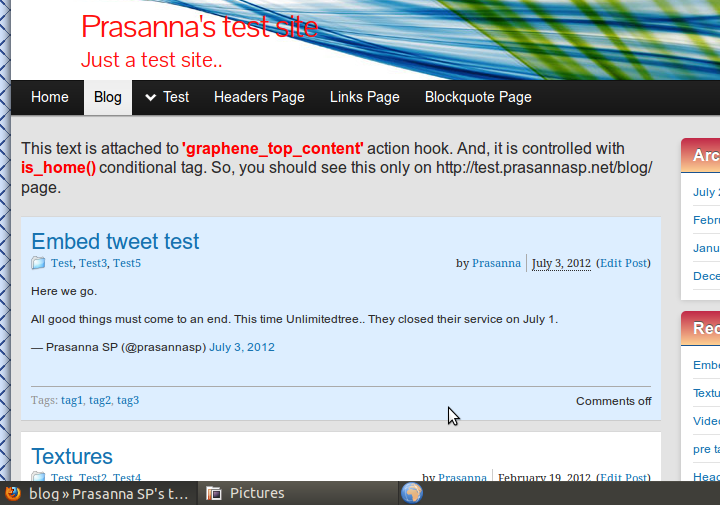 That is the posts page on my test site. You can see some text above the post listing on posts page. That widget is hooked to graphene_top_content (last one in header.php) action and is controlled with is_home() conditional tag. So, this will be displayed only on home page (in other words, posts page). You can use that conditional tag with Widget Logic plugin. Or, if you are comfortable with PHP, you can just use it in a custom function. It looks clear enough that I should be able to work through it now. Already downloaded Widget Login plugin, from your referenced threads above, in readiness! Shall have a serious go this weekend, many thanks, Prasanna.